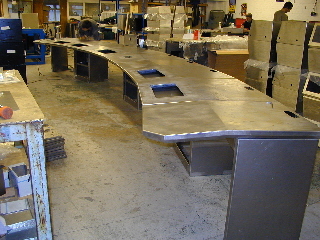 PEM Sheet metal has 35 years of experience in all aspects of sheet metal fabrication. We supply sub contract sheet metal fabrications in mild steel, stainless steel and aluminium as well as exotic metals such as titanium when required. We couple the manual skills required to accurately fabricate products with our capacities in advanced 3D CAD, CNC punching and forming together with our extensive capabilities in precision TIG and MIG / MAG welding. We can fabricate in ether sheet materials or using angles, box sections or tube. PEM Sheet metal has fabricated products a few inches in each dimension up to large items such as the load enclosures for transport lorries for the nuclear industry and Faraday cages to electronically screen whole laboratories. Architectural applications have included stainless cladding for the inside of elevators in prestigious buildings, the doors for exhibition centres and the stainless steel work on the escalators in underground tube stations. We have even fabricated a nine foot high, 100kg cross which sits on the spire of a local church. PEM Sheet metal is a precision metal fabricator of frame work for use in electrical enclosures as well as process pipe work and equipment for the food, beverage and pharmaceutical industries.